herons and cormorants, nesting place for pelicans, hawks and bald eagles and a 14-acre isthmus. 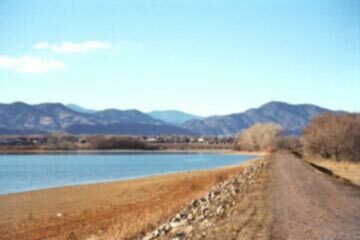 The Grant Ranch Isthmus is represents a type of area that exists nowhere else within the City and County of Denver. This narrow 14-acre parcel of land is bordered by 2 bodies of water and contains 3 distinct ecosystems: riparian, wetland and upland prairie. 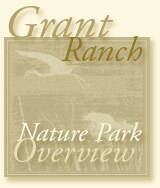 Grant Ranch is also a multi-jurisdictional community comprised of 3 municipalities, Denver, Lakewood and Jefferson County. Bowles Metropolitan District (BMD), was created as a special taxing district and oversees the financial responsibilities and maintenance of this community’s open space. Encroaching development, residential and commercial dumping and vandalism have become an all –too- familiar and reoccurring theme. The shoreline has 170 new homes being built on it, which will continue to further threaten the safety and security of this valuable natural resource. Francesca Owens and the constituents of the BMD have a practical solution: to raise the environmental consciousness of residents and visitors and to show by example that human populations can coexist with wildlife populations in their natural environments. To enhance appreciation of its unique setting, while simultaneously limiting encroachment and destruction, the Isthmus Nature Park and Learning Gardens is planned as a hands-on, field-based, environmental education and observation park. Visitors can experience 3 diverse ecosystems, participate in conservation efforts and become respectful, responsible stewards by learning skills to re-create wildlife-friendly habitats in their backyard and schoolyard. This is done by teaching environmental stewardship principles, which lead by example and make innovative investments in our youth and their future environment. ZONE ONE closest to the street will support the highest level of “cultivated activity” with interactive learning gardens and an outdoor grassy Amphitheater for classroom learning. The goal of these gardens is for visitors to learn “kindness toward nature skills” to be duplicated in their own backyards. ZONE TWO is a transition area acting as a passive interface, with a 16'x16' Nature Overlook with seating, safety rails and interpretive signage. 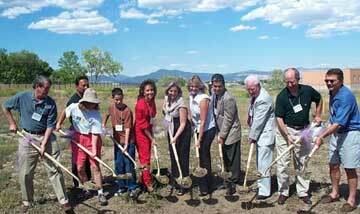 Primitive crusher fine trails with ecological memory points and educational exhibits, all handicap-accessible and an enhanced animal habitat and wetlands restoration. ZONE THREE, the most ecologically sensitive area, is planned to be within the boundaries delineated by the 1997 Western Ecological Resources Report, with no public access permitted. 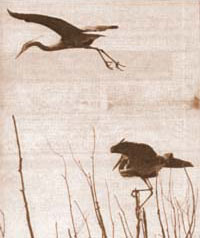 The plan is to enhance, protect and preserve the heron rookery now before we loose these beautiful bird. Copyright © 2005, Francesca Owens. All Rights Reserved. Website design by Spacio Art Studio.